India and China come closer like never before to do business. Warming up : President Xi Jinping with Prime Minister Narendra Modi. Photo: Shekhar Ghosh. Days before Chinese President Xi Jinping arrived in India, the Chinese Consul General in Mumbai, Liu Youfa, had declared that China would commit to investing $100 billion in India over five years. The statement raised eyebrows: would China, which invests around $110 billion overseas every year, make India one of its single biggest investment destinations? Xi's three-day visit to Gujarat and New Delhi may not have answered this question definitively, but it has certainly paved the way for what Indian and Chinese officials hope will be a fundamental change in the way business is done across the Himalayas. 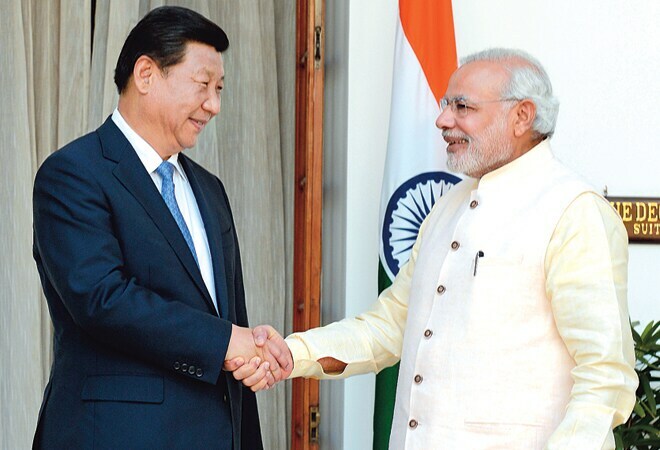 Xi's discussions with Prime Minister Narendra Modi yielded 16 agreements. The most important one was a commitment to realise $20 billion investment from China in the next five years, besides a reduction in the recently widening trade imbalance. In a first, the two countries also signed a $6.8 billion deal to set up China-dedicated industrial parks near Pune and in Gujarat. The 1,250-acre park in Pune will be spearheaded by Beiqi Foton Motor Company, one of China's biggest auto makers. The second one in Gujarat is expected to focus on the power sector. The deals, if realised, could transform India's ties with China. Business ties between the two countries only began to take off in the early 2000s, when a relationship that had been held hostage by the 1962 war and the border dispute began to thaw. As China's economy transformed through its second round of economic reforms in the early 1990s and following its accession into the World Trade Organization a decade later, Chinese appetite for Indian iron ore and natural resources propelled a trade relationship from a stagnant $2-3 billion in the early 2000s to $73 billion in 2011, when China for the first time became India's single largest trading partner. The relationship has since appeared to hit a roadblock. In the past two years, trade declined even as an imbalance in China's favour continued to soar. Indian firms have struggled to secure market access in China, even in information technology and pharmaceuticals where India enjoys a clear competitive advantage. A slowing down of China's economy has left a slump in Indian exports of ores and raw materials. Modi and Xi have agreed to revitalise this relationship. The key to doing so, says Chinese strategic affairs expert and former diplomat Lan Jianxue, who had earlier served in India, is by opening up both markets to mutual investments. The Chinese perception has been that India was, in the past, averse to Chinese presence in many sectors. The hope in Beijing is that Modi, who welcomed Chinese investment in Gujarat as chief minister, will change that. "China sees Modi as a business-friendly politician," Lan told Business Today. "So we expect a huge boost in business ties." The idea behind the two industrial parks, Chinese officials say, is to send a signal that China Inc. viewed India as more than a merely transactional relationship. The power sector is illustrative of how a largely buy-sell relationship, which characterised India-China trade for much of the past decade, has appeared to run out of steam. For India, with a huge power deficit and shortfall in capacity, importing cheap power equipment from China was an easy solution. Today, one in four power plants in India uses some Chinese equipment. This solution was, however, a temporary one. A decade on, companies have struggled with servicing needs as none of the major Chinese power firms have an established presence in India. The industrial park in Gujarat is expected to fill this void. Chinese power companies, for the first time, will manufacture in India and establish a network of service centres. One sector that perhaps holds the greatest promise for major Chinese investment in India is railways. Both countries have signed a first-of-its-kind agreement for Chinese involvement in building and redeveloping stations, raising the speeds on several existing routes to 160 km an hour, and a feasibility study for high-speed or bullet trains. Thirty years ago, India's rail network was superior to China's, both in network length and speed. Today, the two railways are incomparable. China has almost entirely replaced 100 km an hour trains with 160-180 km an hour express trains. It has also built a separate network for bullet trains that run at 300 km an hour. The network is already the world's longest, and will touch 16,000 km by 2015.